Only 5-ingredients, 10 minutes to prep, and doesn’t require any specific spices! If you’re craving something rich, easy, healthy, and delicious, make this Vegan Indian Curry recipe. It’s guaranteed to be a crowd favorite! Yep…I’m talking about this Green Vegan Coconut Curry recipe! This recipe was passed down from my Mom, so it’s been tried and tested for YEARS. For as long as I can remember, people have always made requests for this home-made curry when coming over to my Mom’s house for dinner. It’s always been a favorite of mine and brings back many family memories growing up. Of course you guys all know that my kitchen is stocked with all sorts of Indian spices (I am Indian, of course haha!). But I also know how intimidating it can be for those of you who love Indian food but hesitate trying to re-create dishes at home because you either don’t have the basic spices, aren’t familiar with them, or feel like you’ll only use them once. I still highly recommend you get your pantry stocked with basic Indian spices because they are amazing. But, in the meantime, this vegan Indian curry is your answer to quick and delicious Indian food with basic fancy staples! YES my friends…this brilliant vegan Indian curry is based on the simple combination of coconut milk and cilantro, with the addition of some roasted peanuts (which you can absolutely omit for a nut-free option). I took my Mom’s simple recipe and tested it with a few other spices and additions, but always kept coming back to her simple combination of ingredients. 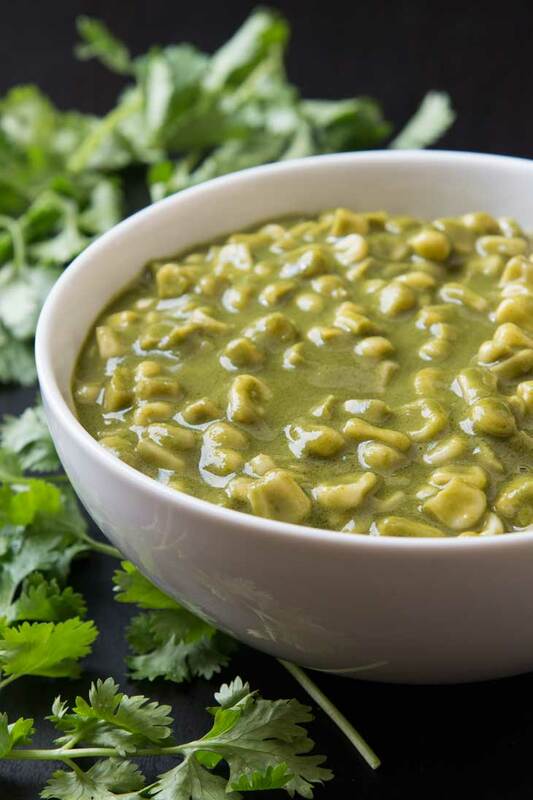 I realized that this green coconut curry recipe may contain only 5 ingredients, but it has everything you’d want in flavor, texture, and richness! …season with some salt and that’s it! 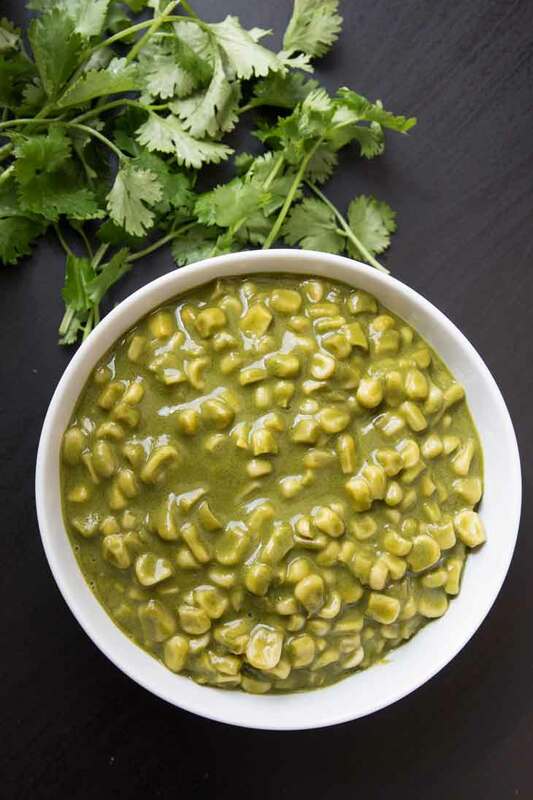 The key is to allow the coconut-cilantro mixture to simmer and reduce to thicken, thereby bringing out the flavor. No additional ingredients needed, no time wasted measuring or sauteing. Just blend the sauce, simmer and reduce, add the corn, and top with crushed peanuts! When corn is in season, it’s fun to use fresh whole cobs cut up into 5 pieces, but I typically end up using the sweet yellow frozen corn from Trader Joe’s since it’s a staple in my freezer and easier to eat, especially for the kids. Serve it with a side of my Indian Brown Rice Pulau, some fresh roti, plain rice or quinoa, or Naan! This effortless curry is to-die-for and is also great to make ahead of time for a meal for your own family, to take to a potluck or dinner party! I recently taught one of my first large cooking parties here in San Diego, and the theme they chose was Indian Food! This dish was on the menu and a favorite of the night, along with my Cauliflower Tikka Masala, Tofu & Mushroom Butter Masala (coming to the blog soon), Dosa, Lemony Potato Masala, coconut Cilantro Chutney (coming to the blog soon), and ended with this Pomegranate Peanut Dark Chocolate Bark! Phew…7 things on the menu and we made it ALL! It was a huge hit and such a great experience. This is one of my favorite easy 5-ingredient curries to whip together for dinner! It's rich, delicious, healthy, and a crowd favorite! 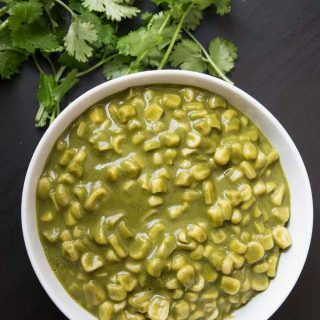 In a blender, combine the coconut milk, cilantro, and green chili pepper. Puree until all the cilantro is completely blended into the coconut milk. Pour the blended mixture into a pot and place over medium/high heat. When it comes to a boil, reduce the heat to medium and gently boil. Stir until the mixture starts to thicken. If Using Frozen Corn: Completely defrost the frozen corn and add it to the curry (note: be sure to drain out most of the water from the frozen corn before adding it in). If Using Fresh Corn: Cut some of the cobs into 4 whole pieces, and cut kernels off of the others. Mix into the pot with the curry. Bring the curry to a boil. Stir well, and reduce the heat again to maintain a gentle simmer. Continue cooking, slightly covered until the sauce is smooth, green, and thick. It'll be reduced by about 1/3 or 1/2. (note: this may take ~30 minutes). Reduce the heat to low and add the peanut butter and crushed roasted peanuts (if using), stirring for about 2 more minutes. Remove from heat, let it sit for 2 minutes. Serve hot with some homemade tortilla, naan, or rice. Peanuts - I highly recommend the addition of roasted peanuts or a little peanut butter. For a nut-free option, simply omit the roasted peanuts. I made this today. Super easy!! Thanks for the comment Tina! It's my favorite Indian dish to make when people come over for dinner because it's really easy to make. Hope you enjoyed the taste! Tried this tonight and what a delightful dish this turned into - fresh and light, it was a bit of Spring on a plate. Beautiful color too! Only it needed more jalapenos (next time!). Had it simply with white rice. Yay I'm so glad you loved this dish...it's awesome and one of my favorites! Who knew something as simple as coconut milk combined with cilantro and some jalapenos would make for such a tasty curry! Depending on how spicy your jalapenos are, I've also found that I've needed more at times. =)Thanks for the comment and thanks for visiting my site. Green curry is one of my favourite curry's, and this one looks so creamy and satisfying! Would love to have a big bowl of it in front of me right now! This is definitely different than most you've probably had, buts till super delicious! and easy to make! After having this at the cooking party, I couldn't wait to make it! I made it last night and it was delicious and super easy. I topped it with fresh cilantro garnish and cashews (no peanuts on hand) and it was amazing. Thanks! You are awesome!! Thanks so much Alison, you made my day! Let me know if you try any of the others, or the Dosa! I will try this looks yummy. I have a concern since we all know most corn is GMO, IM surprised you didn’t say organic corn. Also peanuts are problematic for me, I would sub organic almond butter, do you think this will work? I use the organic frozen corn, but yes did not say it. You can definitely sub almond butter, or simply leave out the nut-butter and top with some chopped cashews even! Thank you!! And YES they are totally pantry ready! This looks so delicious and easy to make! I don't think I've ever tried peanut butter in curry before either- I'm excited to try this! You'll love it! it's just a small amount of peanut butter or chopped up peanuts to give it that hint of nutty-ness! Let me know if you try it out! I am so excited to try this recipe! And lucky for me, I already have all the ingredients on hand! That's the best party...the ingredients are typically pantry ready! Let me know you'll love it. We had a cooking party and this curry was a favorite of the night! Hi Anjali, I have made this recipe several times and it is always a huge hit. My kids love it and guests can't stop raving about it. People are always surprised when I tell them how simple it is to make. Thanks for reposting this recipe. Btw, I have not commented here for a while but wanted to give you a big shout out for your website. I celebrated my son's birthday past summer and made a lot of appetizers from your holiday appetizer themed party menu. Thanks for the wonderful work you do. Hey Anjali, I love how simple and tasty this recipe is! And fortunately enough I think I have all the ingredients at home, I think I can make this tonight ♥ thanks for sharing this! Thank you! Let me know if you try it...you'll LOVE it! Thanks linda!! They really are...hold a special place in your heart! Wow, Vegan, low sodium and Indian! Can't wait to try. Your right I love Indian food but its intimidating to make. Thank you. This is definitely easy to make! hopefully you give it a try and enjoy! Also my cauliflower tikka masala is really easy and one of my most popular recipes. That's awesome to hear! Thank you! What veggies did you use in there? Glad you guys liked it!